It’s the time of year when most music magazines and websites have been revealing Top 10 lists for the year’s best recordings – a dubious undertaking to say the least, but one which I myself cannot resist indulging in. But I’d like to propose another kind of Top 10 list, one that takes as its theme interesting and novel ideas which turn into fun and imaginative activities, then snow-ball into one of the coolest projects you’ve come across in a long time, and all of which takes place on the sidelines to the day-to-day business of recordings and gigs and writing new music. Now, I agree that’s quite a theme for a Top 10 list, but if such a list was put together, surely the $100 Guitar Project would be sitting somewhere at the top of that chart. 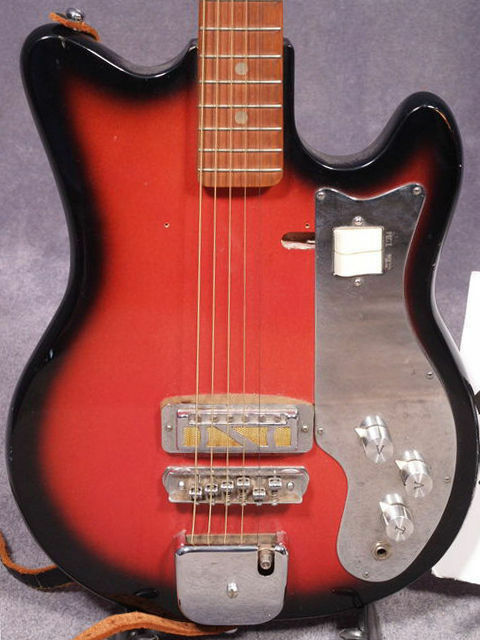 Nick Didkovsky, the mastermind of Dr. Nerve, and Chuck O’Meara, who some might remember under another last name as the President of the Avant Garde and from his band Forever Einstein, bought a no-name electric guitar for $100 without even hearing it. It called their names, so to speak, and they followed their own charmed impulses and bought it. What happened next? 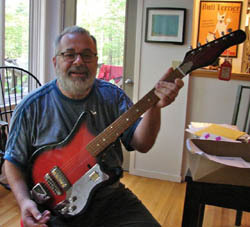 They shared the joy with another guitar-playing friend, who shared it with another, who shared it with another…until the guitar took on a new life of its own, far removed from the life it had up to when Mr. Didkovsky and O’Meara found it sitting in the fateful instrument shop. It eventually passed from the hands of one musician to another, until plans were laid for 40 of these musicians (!) to record their encounters with the travelling guitar for a proposed 2 cd set. The list of musicians who have received, played and passed along the guitar is a rich one. It includes the likes of Elliot Sharp, Nels Cline, Jeff Tweedy, Amy Denio, Fred Frith, Biota, Henry Kaiser, Tom Dimuzio, Rhys Chatham, John Shiurba, Manuel Gottsching, and a host of other known and lesser known names. The guitar has its own Facebook page and there is a great website which documents the history of the project, which you can go to directly below. The website even includes a map outlining the travels of the guitar across the USA. Best yet, the site features some video footage of some of the guitarists playing the $100 guitar, including Keith Rowe playing it in his customary table-top fashion, but start with the Didkovsky video. It’s a very cool piece unto itself! You are currently browsing the archives for the Nels Cline category.